These plugins can create all kinds of delay based effects, sometimes using granular synthesis methods, other times using transformed Fourier methods or even tuned delay lines. It is worth to note that they can really come to live with proper modulation. I can recommend checking the manual for the stock and parasites firmware to learn more about what the different parameters do. 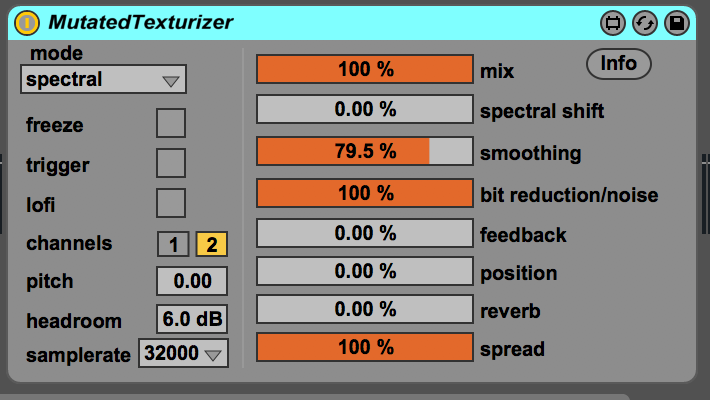 The MutatedTexturizerAlt fx plugin can receive midi data from a miditrack via the NoteIn device. This makes it for example possible to play the resonator as a synthesizer or to pitch grains in a melodic way. You can choose what the internal samplerate of the effect is, this is then automatically resampled from and to your current system samplerate. (It will introduce a little latency if conversion is needed). The internal samplerate setting will change the timbre and ranges of the parameters (this was too complex to avoid and I kind of like the new diversity). The original code is designed to run on a samplerate of 32kHz. Internally the software uses 16 bit fixed point accuracy (or even a compressed 8bit accuracy in the loft mode). For hot signals it can be useful to increase the headroom to prevent distortion (this attenuates the signal before the effect and amplifies it afterwards). This parameter can also be used for its lofi effect. A bunch of presets are included to give you a quick start. - some people have trouble getting sound out of it, this seems related to how the externals are frozen with the device. Please try the download link with the unfrozen devices. EDIT: this seems solved now, please try the new frozen download. - there is a vulnerability (chance for a crash) when loading a preset or plugin and perhaps even when switching modes. Until this is completely fixed it is best to stop Ableton live when you perform this action. - note: if you encounter a crash, please send me the crash report.